A recent, apparently insignificant, news item has drawn the attention of the nation! Dow Chemical, the present owner of US based multinational Union Carbide, is currently attempting to recruit students of IIT Chennai on campus for their company and subsidiaries. The alumni of this prestigious institution have taken up the matter with members of the Senate of IIT Chennai, to urge the authorities of IIT Chennai to bar Dow Chemical and all its subsidiaries from campus recruitment. The name Union Carbide rings a bell. Union Carbide, it will be recalled, was the owner of the ill fated plant in Bhopal, capital of the Indian State of Madhya Pradesh, which on 3 Dec 1984 was involved in a deadly gas accident resulting in the death of over 20,000 people and incapacitating over 120,000 persons who continue to suffer to this day. As a consequence, Union Carbide is a key accused in a criminal case related to the Bhopal gas disaster where the company is charged with “culpable homicide not amounting to murder”; a serious criminal offence, in any court of law, in any part of the world. To make matters worse, Union Carbide has avoided summons issued by the Bhopal Court all these years. Because it has failed to honour summons issued by the Bhopal court, the company was declared an absconder in 1992. Since Union Carbide has not even responded to summons in this criminal case, Dow Chemical, the present owners of the accused company, become guilty of shielding a criminally absconding corporation and have, therefore, also been charged in the criminal court for sheltering a fugitive. Till date, Dow Chemical has failed to make Union Carbide, its 100 percent subsidiary, appear in court to face trial. As a result of this completely callous attitude of the corporations concerned, Dow Chemical is the target of a concerted campaign by survivors of the gas tragedy and families of those that perished. The objective of this campaign is to draw attention to the fact that these guilty people are being allowed to get away without being punished for their actions and without providing adequate support and compensation to those that were affected. The alumni of IIT Chennai are acting in support of those affected by the world’s biggest eco-disaster. What happened on the fateful night is worth recounting. During the dead of night of 2/3 Dec 1984, a gas holding tank with 43 tonnes of stored Methyl Isocyanate (MIC) belonging to the Union Carbide plant located in a crowded locality of Bhopal, overheated and released toxic heavier-than-air MIC gas which rolled along the ground through the surrounding streets. Though the siren alarm was activated to warn the residents of Bhopal, it was quickly switched off to avoid causing panic among the residents. Thus, many continued to sleep, unaware of the danger that had been let loose in their city. Many others having heard the alarm siren being switched off assumed that the danger had been taken care off, went back to sleep. Brigadier Navin Mayne was yanked out of his bed by a telephone call from the Commissioner of Bhopal, the senior most civil head of administration of that Division, to be informed of the disaster and to seek immediate help from the Army in aid of civil authority. Brig Mayne, being the Sub-Area Commander was the senior Army Officer in station, reacted with usual alertness; he was out of his bungalow in the Cantonment in less than 15 minutes. Being familiar with the city, he knew where he needed to go but did not know of the danger that lurked ahead. As he drove closer to the plant, he saw a sea of humanity writhing on the ground unable to breathe; many already dead. Good sense prevailed, he turned around and headed for the Commissioners residence, which had by then become a beehive of activity. Soon the Army was formally called out to help in rescue of the injured and disposal of the dead. As the day broke over the city reality dawned on the administration and the people. The transportation system in the city had collapsed and many people were trampled trying to escape. According to the legal case filed, around 500,000 people were exposed to the leaking gas. Of these approximately 20,000 are believed to have died. Even after 24 years, over 120,000 people living in and around Bhopal continue to suffer from the effects of the disaster, such as breathing difficulties, cancer, serious birth defects, blindness, gynaecological complications and other related problems. The majority of deaths and serious injuries were related to pulmonary odema, but the gas caused a wide variety of other ailments. Signs and symptoms of MIC exposure normally include coughing, dyspnea, chest pain, lacrimation, eyelid odema and unconsciousness. These effects might progress over the next 24 to 72 hours to include acute lung injury, cardiac arrest and eventually death. Because of the hypothesized reactions that took place within the storage tank and in the surrounding atmosphere, it is thought that apart from MIC, phosgene, and hydrogen cyanide along with other poisonous gases all played a significant role in this disaster. Needless to add, Brigadier Navin Mayne succumed to the effects of MIC gas and passed away in Military Hospital in 1989. The President of India decorated him with the Ati Vishist Seva Medal (AVSM). His wife and children are yet to receive the promised compensation. What has been given so far is peanuts and that too in petty installments! As a result of the inquiry held, it has been reported that apart from the disaster, Union Carbide’s routine operations in the Bhopal factory have resulted in a massive environmental contamination problem that has not been addressed till date. Several thousand tons of toxic waste, obsolete pesticides and contaminated material and machinery lie strewn in and around the factory site. Over the years, this toxic waste has released its poison into the groundwater. More than 20,000 people living in and around the area are forced to consume this contaminated water in the absence of any alternative. Tests carried out at IIT, Kanpur, by a New Delhi based fact finding mission on Bhopal, showed the presence of toxic chemicals such as chloroform, chlorobenzenes, dichloromethane and heavy metals such as lead and mercury in the breast milk of mothers in these communities. Unfortunately, Union Carbide and Dow Chemical have refused to contribute towards the cleaning up of the environmental contamination and ground water sources. Dow Chemical purchased Union Carbide in 2001 for $10.3 billion in stock and debt. At the time of this take over, it was stated by the management of Dow that Union Carbide settlement payments have already fulfilled Dow’s financial liability for the disaster. They are depending on the 1989 settlement that was arrived at with the assistance of the Government of India. While it is clear that all compensations have not yet reached the affected families, it is equally surprising to note how Dow Chemical is equally certain that all its liabilities as inherited from Union Carbide stand cleared! 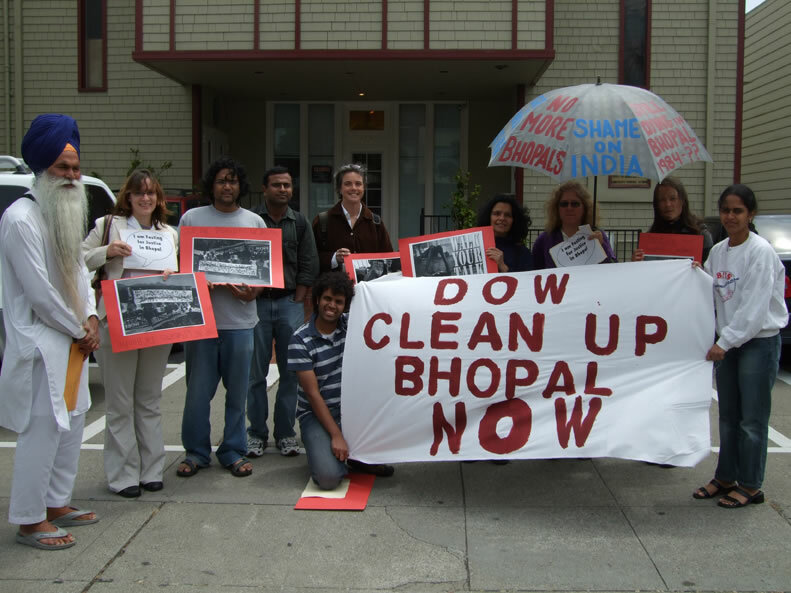 Some Dow Chemical share holders had even filed suits to stop the merger on the grounds of the outstanding liabilities for the Bhopal disaster. The merger had gained criticism from the International Campaign for Justice in Bhopal, an NGO championing the cause of the affected, as it was – “contrary to established merger laws”, when Dow denied any responsibility for Union Carbide’s Bhopal liabilities. According to the Bhopal Medical Appeal, another organisation working to help seek relief for the affected families, – “ Union Carbide remains liable for the environmental devastation”, as environmental damage was not included in the 1989 settlement, despite ongoing contamination issues. Dow Chemical’s motive behind the relationship it is attempting to forge with IIT Chennai is certainly not with the intention of furtherance of science and technology! It is an attempt to acquire legitimacy and credibility by associating itself with an IIT in India. Any association with Dow Chemical will certainly tarnish the impeccable reputation of IIT Chennai. By refusing campus recruitment to the company, IIT Chennai will be sending a strong signal that it stands by principles of justice and ethics. How strong is the case of the victims and others against Union Carbide can be gauged by the fact that recently it was discovered in the course of another lawsuit against Union Carbide, for environmental contamination, before a New York Federal District Court, that Carbide had exported “untested, unproven technology” to the Indian plant. While the management of Union Carbide has consistantly avoided facing Indian courts, the people of the town of Bhopal continue to suffer from the after effects of one of world’s largest enviromental disasters. It is this tragedy, in the fitness of things, that the alumni of IIT Chennai have taken the lead to once again highlight by preventing Dow Chemical and Union Carbide from making a backdoor entry into India and thus regain respectibility. I read thatlawyer Nani Palkhiwala(mumbai based)single handedly thwarted all attempts to get the Bhopal case transferred to India,from New York court,by making uncalled for concessions/submisions.As a result case was not transferred to India. I believe it’s true. Will you shed more light on this fact and legal aspects.And more light on Nani Palkhiwala’s in famous role. If you come to Mumbai I shall met you.